By Edwin Atkins Ltd. Elegant solid oak stick / umbrella stand that would have graced the hallway or office of an R.A.F. station or Air Ministry building. Approximately 72 x 72 x 26cm with sectioned top raised on four shaped support legs. 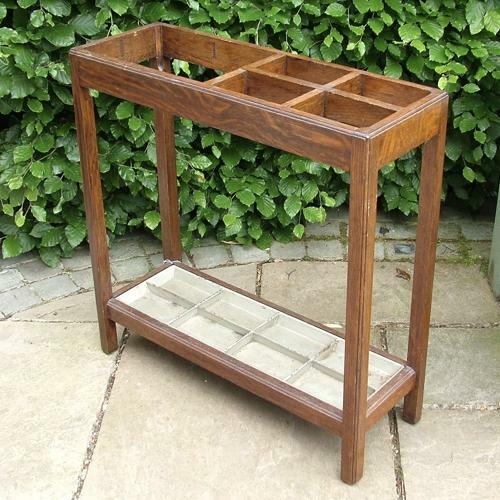 Elevated solid wooden base inset with sectioned metal drip tray. It would appear that the top was originally divided in eight sections but half have been removed at some stage, seemingly a long time ago. This has been carefully done and is not particularly obvious or detrimental. Minor damage to the end of one dividing bar (see photograph). The stand has a varnished/waxed finish and has a pleasing patina. Light overall wear commensurate with age. No woodworm. Clear King's crown Air Ministry stamp on the base. Also marked with manufacturer's details and 1937 date. E. Atkins was established in 1879 with factories in Bethnal Green, London and Birmingham. Production moved to Wembley in 1920 and the company ceased trading in 1989. This rare survivor is the only example we have ever seen and would look fabulous in any setting. Due to the size and weight we would prefer collection but shipping can be discussed if necessary. Stock code M23002.